Heritage Highlands At Dove Mountain is located in the Dove Mountain area in Northwest Tucson. Recently renamed “The Highlands At Dove Mountain”, Heritage Highlands is an Active Adult Community. Activities abound, including golf, tennis, pool, and fitness center. The updated community center/clubhouse has meeting rooms, library, and dining. 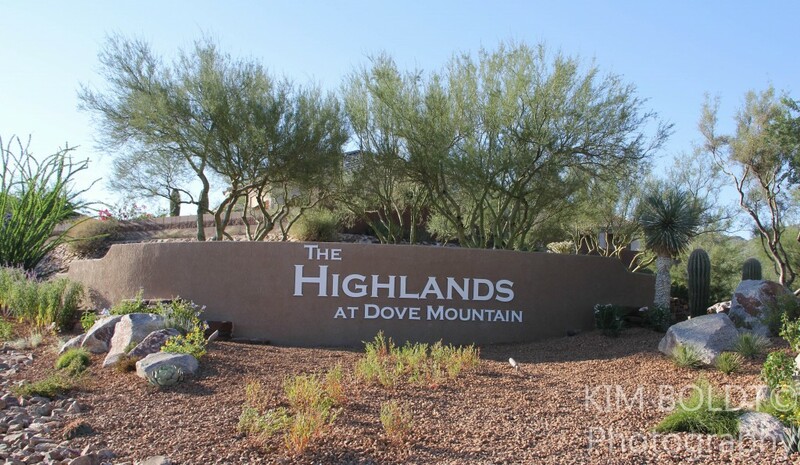 Heritage Highlands is part of the Dove Mountain Master Planned Community a few miles west of Oro Valley. Two new Dove Mountain shopping center are just minutes away. These shopping centers offer a range of services including restaurants and food markets. Sonoran desert plants and native growth are a key element of the landscaping throughout the community. The desert setting combined with the Southwest architecture creates a luxurious living. With over 20 distinctive floor plans with 1,100 to 2,600 square feet, there is a home for everyone. Heritage Highlands is a gated community with a total of 1,297 homes built between 1997 – 2007. Homes are predominantly single family with a few “townhouses” available. All homes in the Highlands are single story stucco construction with tile roofs. A centrally located clubhouse is the center of activity in Heritage Highlands. Set above the 9th green this 29,000 square foot facility has outstanding views. The facility has two outdoor patios, pools, fitness center, community rooms, restaurant and more. A library provides panoramic views of the area surrounding the clubhouse and creates a relaxing setting to read or just “veg out”. Golfers have a full-service Golf Shop, driving range, putting green and short game practice area. The golf course is challenging but fair. And if you need some work on your game, lessons are available from the on-site golf professionals. There is a Home Owners Association (HOA) at Heritage Highlands. The Highlands has recently added Pickleball courts. Another popular Active Adult community in Tucson is Saddlebrooke and Saddlebrooke Ranch. Searching Tucson Arizona Homes for Sale? We can help! Questions on the Tucson Real Estate Market or Heritage Highlands Homes for Sale? Call us 866 316 5575 or send the CONTACT FORM and we will get right back to you!